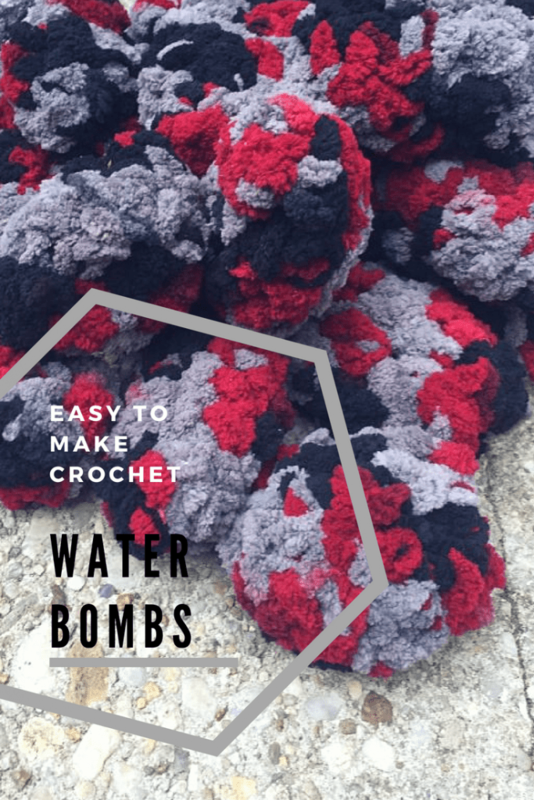 Reusable Water Bombs- Crochet, washable, and FUN! Kids love water balloons, but I HATE them. First you spend money on them, then you spend ages filling them (or having them fill them) and you pay the water bill for it, then the kids have all of 5 minutes of fun, and then you spend hours finding colorful balloon fragments all over the yard. It’s awful. Recently I saw “reusable water balloons” and thought it was an AMAZING idea. I’ve done quite a few similar things in the past, but nothing seems to last very long. The reusable balloons use the fuzzy blanket yarn, hold a TON of water, and the kids love them! I made up an easy pattern for you. I decided to call them “Water Bombs” because when I called it a balloon so many kids said “But how do you fill it?” A bomb doesn’t need filling, it just is. 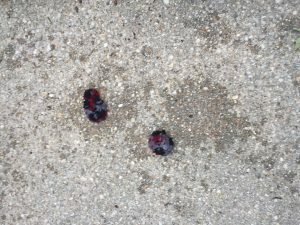 Here’s some things to note- precision isn’t important, if you skip a stitch, lose count, maybe one comes out bigger or smaller, maybe it’s a bit blobby, trust me, the kids won’t care. This is a perfect beginner project, because any mistakes do not matter at all. It can be a bit tricky to work with the yarn, but since mistakes don’t matter anyway, I think this is a project for the masses. After I spent time designing a balloon shape, and then complaining to myself that it wasn’t very “balloony” the kids begged me to just make ball shapes! 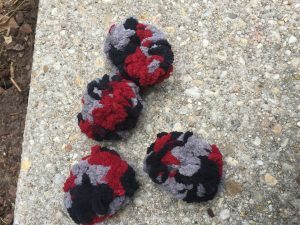 After making just a few with a yarn scrap I sent them outside to a batch of product testers. The kids went crazy for them! But they were glad to hear they’d be different colors. (The originals were “girly.”) My son picked a giant ball of this color at the thrift store. So the color possibilities are clearly endless. Lots of people are making them with bright colors, like real balloons would be. Ch 2 and DC around, join. IF you want the ball shape, stop now, and simply end off, and hide the ends. You’re done. You don’t even have to sew the end shut. The kids like jabbing it on their fingers or slinging it around. Ch 2, 2 DC in next stitch, DC in next, around. Join. now you’re done, just fasten off. YES! You can quickly whip up a pile. They are soft, don’t hurt when you get hit with them, and they hold a LOT of water. It may not look like much, BUT that is just from one quick slam. 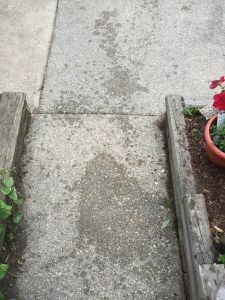 After just a few minutes with only two boys, two bombs, and less than a cup of water, the sidewalk looked like this, and they were wet as well. They were also begging for me to make them some, and offering me exorbitant amounts of money for them. 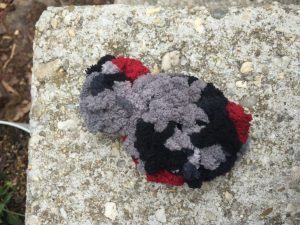 AND let’s say your kids are suddenly obsessed with finger knitting, or you want to help a group of kids make some of these, I tried it and that works too! They were just rectangular, but absorbent all the same. Simply hold two strands together, use four fingers, and make it a few inches long! If you want to make them and don’t know how to crochet I have a tutorial video! You’ll need the Double Crochet stitch and the Decrease technique. To Decrease, you are going to do the same double crochet, but go into one loop yarn over and pull through, then go into the next stitch yarn over and pull through. Then YO and go through 3 loops, then YO and go through the remaining two. You will work two decreases together. I’ll try to make a video for that! Here’s are some links to the supplies you need to get started! These are Affilliate Links and if you make a purchase I will make a small commission at no cost to you. I intentionally picked one of the cheapest online sources I could find to help you get started inexpensively! Hi Morgan! What I did was essentially create a rectangle of the yarn held double. The shape is different than pictured but it still holds a ton of water and throws well!